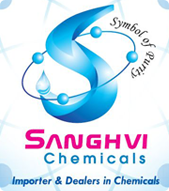 Sanghvi Chemicals was started as a brokerage company under the mentorship of Mr. Bhavin Sanghvi. The company received blessings from "Rajhanssuriji Maharaj Saheb" and thereafter attained milestones of success in the domain by owning two companies. The company remains firmly committed to its premier aim of providing high quality Chemicals at affordable prices to the clients. Sanghvi Chemicals is line of the ambitious and upcoming company engaged in sourcing / Indenting wide range of Chemicals for Industries like Textile, Powder Coatings, Paints, Adhesives, Imitations, Plastic, Detergent and many more looks beyond standard solutions to develop new insights, mobilize resources and make our partner more capable of meeting challenges in the India Market Sanghvi Chemicals works with reputed quality conscious manufacturers from China, Korea, Taiwan and offer wide ranges of Products for Chemicals Industries. We assure and promise you high quality, Excellent Services & Special attention to individual customers need. We consistently improve the standard to achieve outstanding results at the optimum cost, we enjoy an excellent credibility among customers and suppliers who know that our experience, Expertise is always at their disposal. At Sanghvi Chemicals, we aim to be the leader in our products and markets by providing high quality services to our customers. We pursue excellence in all that we undertake and take steps to continuously improve ourselves. And through the innovative application of our knowledge and our infrastructure, we aim to grow responsibly. To provide total customer satisfaction and achieve leadership in our products and services across the globe, through excellence in technology quality and continuous improvement in all our areas of business. Quality is the utmost priority of our company and for that we have employed highly qualified and experienced quality mangers who stringently test each product before delivering to the clients. All our products undergo a comprehensive check for the quality under various parameters.